If you renewed your subscription under the same email address, you can find your new subscription in the Online Test Center under a new student name. 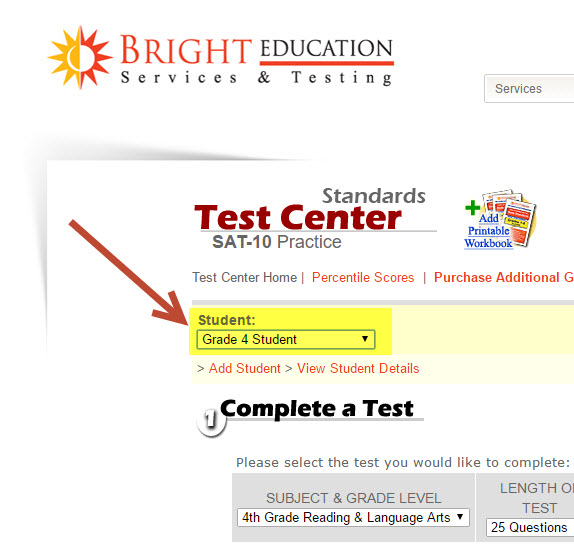 If you have purchased from us in the past and have just purchased tests for the next grade level, a separate student account was created in your Online Test Center when you checked out. This is so that you can still save your previous year's results and keep the new year's results separate. When you get to the Test Center, please use the drop down menu next to "Select A Student" to go to your new account for this year. If you have done this and still see the text, "Please add a student to continue", please try adding a student or updating the student record. Sometimes, the account would need to be added or refreshed to begin.